As New Orleans fights to make a comeback after Katrina, the evidence that city parks help improve physical and mental health continues to mount — beyond the expectations of even the most enthusiastic park advocates. 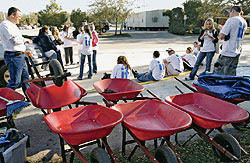 To date, more than 6,500 volunteers have invested more than 34,000 hours in cleaning up City Park. Here’s the story of how New Orleanians are rebuilding their parks and what it symbolizes for them. Can restoring parks and building new ones help bring a city back from disaster? New Orleans considers the many benefits parks can bring. As Ed Marshall, a member of the Trust for Public Land's New Orleans Advisory Council said of City Park, parks can be the place where "political differences, ethnic background, and economic status cease to matter." Before Hurricane Katrina blasted through in August 2005, New Orleans's City Park was a recreational paradise, the city's outdoor heart and soul. Annually more than 11 million people visited its grounds, playing golf, tennis, soccer, and baseball; strolling through its grove of mature live oaks (some of them 600 years old); visiting the New Orleans Museum of Art; attending weddings and other celebrations; boating; picnicking; or pursuing myriad other activities the park accommodated. Established in 1854, when a 100-acre parcel near the center of New Orleans was willed to the city by its former owner, City Park expanded over time to more than 1,300 acres, making it one of the largest urban parks in the country. Katrina left 90 percent of the park covered with floodwater and its infrastructure in shambles. But a year and half later, City Park is again beginning to hum with activity as New Orleanians find refuge and respite there. The story of its valiant struggle to recover from the storm testifies to both the resilience of a city and the healing role that parks can play in a time of extraordinary psychological stress. No city in the country today is more in need of the physical and psychological benefits that parks can offer than still-recovering New Orleans. Much of the city remains in ruins and less than half of New Orleans's pre-Katrina population of 485,000 has returned. Many who did stay or return are still suffering. According to a June 2006 report in the New York Times, "New Orleans is experiencing what appears to be a near epidemic of depression and post-traumatic stress disorders, one that mental health experts say is of an intensity rarely seen in this country." "These are classic post-trauma symptoms," Susan Howell, a political scientist at the University of New Orleans, told the Times. Howell, who conducted a survey on how people are coping with everyday life, said, "People can't sleep, they're irritable, feeling that everything's an effort." The evidence that city parks contribute to improved physical and mental health of residents continues to mount—beyond the expectations of even the most enthusiastic park advocates. Under normal conditions, parks—even small oases of grass and trees amid the concrete and asphalt of the metropolis—allow city dwellers to commune with nature, interact with neighbors in a serene environment, exercise or lounge, and return home refreshed. In New Orleans, where oncevibrant neighborhoods remain piles of rubble, where crime is rising and uncertainty reigns, the need for a place of serenity is magnified beyond calculation. In this environment, City Park has become a refuge, a reminder of happier times, and a harbinger of the city's return to life. The road back was a long and difficult one, though. With a few minor exceptions, every facility, every maintenance building, and every piece of maintenance equipment was severely damaged or destroyed. 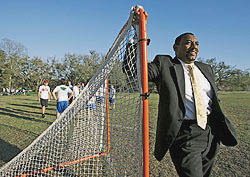 The park's pre-Katrina staff of 240 was reduced to 23, and Bob Becker, CEO of City Park, was left in charge to pick up the pieces, literally. "We got back the first week after the storm and there was tremendous damage," recalls Becker, a deep-rooted New Orleans resident. "All our equipment was destroyed, and we couldn't even get back into our office until the first week of October. But people were anxious to get back in the park. There weren't a lot of other diversions. Movies and even private health clubs were closed. So people wanted to use the park, and they were willing to help to get it going." The first to turn out were tennis players. Falling tree limbs had shattered fences in the tennis area and remained lying athwart them like triumphant wrestlers. The courts and surrounding facilities also were wrecked. The volunteers began by cleaning up the tennis house, then removing limbs and debris from the fences and courts. The fences were repaired and their windscreens hung. The courts were swept, the nets replaced, and by mid-October—less than two months after the storm and with much of the city still paralyzed—people were playing tennis at City Park. The golf courses were a little more problematic to revive, but the same need for recreation inspired the city's golfing community. "The golf courses were flooded, and we didn't even have lawn mowers," says Becker. "So when the waters receded, we decided to get the driving range open—give people a chance to get out their frustrations whacking a golf ball and at the same time generate some revenue for the park." With his skeleton staff and an infusion of volunteers, Becker managed to clean up the driving range, though there was still no fresh water for irrigation and no electricity to power lights. Adding to the difficulty, the ballpickup machine was destroyed and the supply of balls was severely depleted. Nevertheless, Becker says, when the driving range opened in late February, "the turnout was tremendous. When we ran out of balls, we'd blow a whistle and golfers would go out and retrieve them. We only had a few balls, so there was a lot of whistle-blowing." Sports enthusiasts weren't the only ones who needed their park. One day last spring Becker received a call from a woman asking if the park's Storyland facility was available to rent. Storyland is a playground adorned with 26 exhibits from children's fairy tales, and for generations it has been a traditional venue for birthday parties. The woman wanted to celebrate her young daughter's birthday there, in the same place she had celebrated hers as a child. Storyland was still closed but, according to Becker, the woman pleaded: "I'm not having a birthday for my daughter in a gutted house. I want it in a nice setting." Two weeks later—just in time for the birthday celebration—Storyland reopened. The pattern continues. "Once we get something back open, it is used," says Becker. "Well used." To date, 6,500 volunteers have invested more than 34,000 hours in bringing City Park back after Hurricane Katrina. Observers feel that City Park's slow rise from the ruins is an important symbol for beleaguered New Orleanians. John Beckman served as an urban planning consultant to the Philadelphia-based planning firm of Wallace Roberts & Todd, which oversaw the Bring New Orleans Back Commission, charged by Mayor Ray Nagin to plan for the city's recovery. "Volunteers are coming in, and so is outside capital," Beckman says of City Park. "It gives people the feeling that, yes, there's movement. Yes, things will be better." Restoring the park also is a goal on which all New Orleans residents can agree, says Ed Marshall, who serves on TPL's New Orleans Advisory Board. "City Park is this wonderful piece of earth where political differences, ethnic background, and economic status cease to matter. It has been for years New Orleans's common denominator and our most treasured landscape." Hurricane Katrina was unquestionably a disaster for the city of New Orleans. But the rebuilding process presents unprecedented opportunities to create a model city with a new park system as a unifying element. "New Orleans has large parks—City Park, Audubon Park—that are centrally located, but it doesn't have many smaller parks in neighborhoods," notes Larry Schmidt, director of TPL's New Orleans office. "This is a chance to build a park system that links the city together. In the midst of this colossal rebuilding effort, we can't forget the value of parks." Major cities across the country have learned the value of parks and are in various stages of retrofitting green space into the urban fabric. Both Atlanta and Boston are replacing decrepit infrastructure with new green space, parks, and trails. In Chicago, Mayor Richard Daley recently announced his intention to make the Second City the first city in green space. Chicago boasts impressive parks near downtown and along the shore of Lake Michigan, the newest being highly regarded Millennium Park, opened in 2004. Now the greening effort is moving into underserved neighborhoods. Chicago is replacing asphalt school-yards with grass, adding gardens in high-rise buildings, and insisting that developers planning projects along the Chicago River include a public promenade along the river's banks. Renewed enthusiasm for urban green spaces is fueled by both aesthetic and practical considerations, urban planners explain. Green cities are more visually appealing, to be sure, but statistics show they are also safer and effectively increase the value of surrounding properties, which means more tax revenue. "New Orleans has a great opportunity to create a model city where people go and say, 'Wow, they did it right,'" says Ron Sims, executive of King County, Washington, and a strong advocate of park development in his Puget Sound county. "Parks are an essential part of the infrastructure. Good neighborhoods have them and bad ones don't. A great people doesn't rebuild past mistakes. New Orleans officials have to have vision, a vision that promises people a better future. And nothing enhances the value of the urban experience more than a walkable city with trails and parks." Alex Garvin, a principal with the New York City-based planning firm Alex Garvin & Associates, makes the case for how parks enhance property values in his book The American City, What Works and What Doesn't. But he also emphasizes the health and utilitarian benefits of parks, especially in New Orleans. "New Orleans is an unusual city, and rebuilding has to pay attention to historical conditions. But parks in flood-prone areas can be useful," explains Garvin. "Boulder, Colorado, has a park that floods every spring. It is designed to absorb water. When the water recedes, the park goes back to being picnic areas and ballfields." He cites another example: "Louisville's waterfront park is designed to absorb overflow from the Ohio River. New Orleans can apply the same concepts." The Bring New Orleans Back Commission recommended that park space be woven throughout the city, including the city's many roadway medias, known as "neutral grounds." In the aftermath of Hurricane Katrina, Mayor Ray Nagin established the Bring New Orleans Back (BNOB) Commission to create a framework for reconstruction. Chaired by Joseph Canizaro, a local developer and past president of the Urban Land Institute, the commission was composed of approximately 200 members—experts in a variety of fields, from geologists and engineers to The Trust for Public Land's Larry Schmidt, who cochaired the land use subcommittee. The commission's goal was to create a comprehensive master plan for rebuilding, concentrating on safety issues but also emphasizing aesthetic elements, particularly parks and open space interwoven throughout the city. One recommendation envisioned new parks in floodprone areas that would combine both aesthetic and utilitarian functions. In these low-lying areas, parks would incorporate cleverly landscaped canals or reservoirs capable of handling stormwater runoff. Yet to many New Orleans residents, creating parks seemed a low priority in the midst of all the damage and chaos, where so many problems cried out for immediate attention. Even Bob Becker, manager of City Park, sympathized with his neighbors' reaction. "If you are in a devastated neighborhood, the condition of the local park is the last thing you think of," he acknowledges. "Government has to make decisions about what is important, and you take levees before parks." But the commission, as it was charged to do, adopted a long-range view. Its mission was to create a master plan that went beyond repairing neighborhoods to restoring a world-class city. And a hallmark of all such cities is parks and open spaces. "With the discussion so far focusing on infrastructure," the commissioners wrote in the "Parks and Open Space" section of the report, "we might remember to ask a question: If the city is not also a beautiful and inspiring place, why would anyone want to live there?" The report noted that while New Orleans boasts the large, nationally renowned Audubon Park and City Park, open space in most of the city's neighborhoods was nonexistent or inadequate. During the rebuilding, the report recommended, open space should be added and neighborhood connectivity achieved by thoughtful use of the city's "neutral grounds," wide roadway medians that could be used by pedestrians and cyclists and for public transportation. The report also recommended incorporating canal rights-of-way into the park system. The report outlined potential sites for new parks in various districts and identified specific areas within which property could be acquired and parks created— which specific properties might be acquired would be determined with ongoing citizen involvement. The key issue, commission consultant Beckman says, is, "How many people will return?" The commission anticipates a phased resettlement. "We will talk to people, involve them in the process, as they return," Beckman says. By midsummer of 2006, news reports indicated that houses, even severely damaged houses, in virtually every neighborhood were selling for higherthan- expected prices. According to the reports, many of the buyers were developers and investors, an encouraging sign of confidence in the city's future. "Many neighborhoods have already gone ahead and tried to plan," said Beckman. "There is an awareness that parks are important in the redevelopment of New Orleans." The BNOB Commission enthusiastically endorsed ongoing efforts to increase access to the Mississippi River. New Orleans is a working port, and for centuries public access to the river's banks has been blocked by loading docks and warehouses. Many of these in the downtown area are no longer in use, however, and over recent decades the city replaced such derelict structures with the Moon Walk, Woldenberg Park, and the Riverwalk, creating a pleasant open space along the river from Canal Street to Esplanade Avenue. Since 1999, when TPL opened its New Orleans office, Larry Schmidt has made considerable progress developing plans to extend recreational space even farther along the riverfront. A new park along the riverfront proposed by TPL will be close to a mile in length and about 150 yards to 200 yards wide, and will include bicycle and walking paths, benches, a museum, a restaurant, and a concert venue. In April 2003 the Port of New Orleans signed a memorandum of understanding with TPL, assigning the organization the task of designing the park and then finding sources to fund its construction and maintenance. The BNOB Commission embraced the TPL plan and, in fact, recommended broadening its scope, suggesting that the riverfront walkway be extended all the way from the Industrial Canal to Jefferson Parish. "New Orleans has been handed a unique and rare opportunity to utilize parks as a catalyst for rebuilding our city," said developer Joseph Canizaro, who also serves on TPL's New Orleans Advisory Council, of which he was founding chair. "We need to utilize every incentive that can be offered to stimulate our economic recovery. It has been proven time and time again, across the nation, that parks and open space do exactly that." The riverfront park has already stimulated significant investment activity. Samuel & Company, a major Miami-based developer, is far along in negotiations with Entergy, the New Orleans electric power company, to purchase an abandoned power plant next to the proposed park. "I'm sure we'll get it done," said company principal Michael Samuel. "This project will be a mixed-use city within the city. It's going to take a rundown area and make it beautiful." Samuel, who has undertaken similar projects in Miami and Baltimore, said the renovated building will include residential units and retail and office space. It will also include a major music venue. He estimated the cost of renovating the power plant and building a bridge connector to the waterfront park at around $500 million. Schmidt says that TPL will be actively engaged in the rebuilding process. "We will continue to emphasize the opportunity New Orleans has to create beautiful and valuable open space, but we will do it while working with neighborhood planning groups," he explains. "If the community wants a park, we will help them design it. We will help with the design of neutral space along roadways. We will help with the restoration of City Park, replanting trees, or building community gardens. We want to be an intellectual resource and help with land acquisition." A recent $3.2 million grant from the Rockefeller Foundation will facilitate the rebuilding planning process begun by the BNOB, notes John Beckman. As people return—or choose not to return—determining the location of new parks will become easier. "The networking of neighborhoods through parks provides many benefits, especially a connectedness that does not exist right now," Beckman explained. "As the experience in City Park shows, at a very basic level, people understand the importance of open space." Jim Miara is a freelance writer based in Needham, Massachusetts.